Casa del Sol is a delightful old whitewashed house in the heart of the ancient town of Altea, on Spain's Costa Blanca coastline. Situated in an elevated position in the officially protected Old Town, the house enjoys wonderful sea views. Just a few minutes walk from the Plaza and the magnificent blue-domed church of the old town it is the ideal base to relax and enjoy the atmosphere of Mediterranean Spain. Altea and it's surrounding areas provide a cultural and sporting paradise, which includes music, art, theatre and dance as well as golf, sailing, cycling, tennis, squash and scuba diving. The bodegas of the Jalon valley, the ancient town of Guadalest, the cities of Valencia and Alicante or the mountains surrounding the town are all excellent day trip destinations. Altea is conveniently located just 45 minutes drive from Alicante or 90 minutes from Valencia airports. It can also be also be easily reached by train or bus from Alicante airport. The first floor is accessed by a stone staircase and consists of a second sitting room with small balcony and wonderful sea views, and the master bedroom with double bed and en suite shower and toilet. To the rear the bedroom opens on to a private enclosed terrace suitable for barbeques or evening drinks. Another a stone staircase leads from the sitting room to the second floor which consists of two further bedrooms with twin beds, exposed timber roof structure and ensuite shower and toilet. (Please note that the ensuite shower / toilet and third bedroom are accessed through the second bedroom). The house has been furnished to a high standard with tiled floors throughout and is fully equipped. It is frequently used by the owners themselves and is extremely well maintained. Because of the narrow stone staircases we would not recommend the house for very young children or for the less mobile. Altea is conveniently located just 40 minutes drive from Alicante or 90 minutes drive from Valencia and Murcia airports. The town can also be easily reached by bus or train from Alicante airport. All bathrooms are modern and well equipped and have been recently refurbished. Golf locally at Don Cayo Golf Club at Altea Hills. There are many other golf clubs to visit. 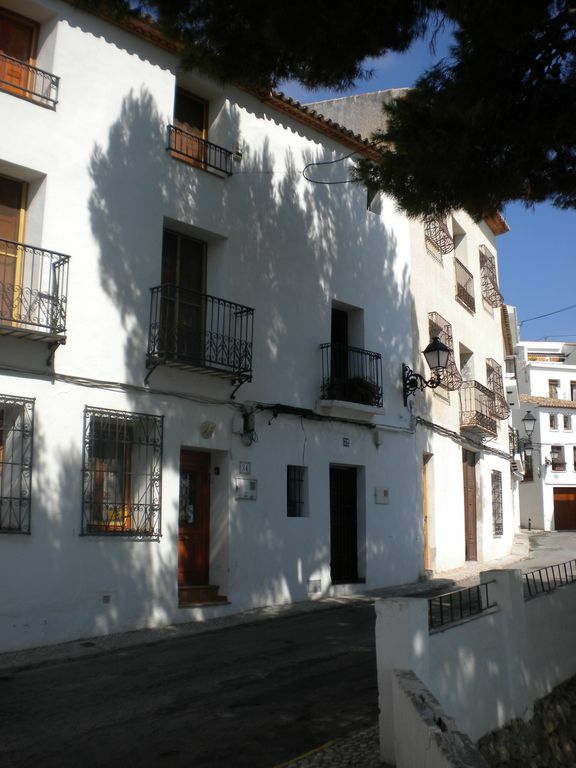 Perfect house situated in the heart of the old town. Some of the best views in the area just outside the front door/balcony. Inside the property is everything you’d need and more! I shall be back very soon! What a fabulous location A truly lovely comfortable home to spend your holiday anytime of the year . Soak up the history! A privilege to stay here! An excellent location, a few minutes walk from the beautiful centre of the old town, yet only 5 minutes walk from all the modern ameninties that Altea has to offer, and walking distance to the beach. We loved the house. It had everything we needed, very clean and well maintained but more importantly the owners have retained the charm and history that belongs to these old townhouses. We particularly enjoyed our evenings on the beautiful terrace. Location, facilities and general all round charm - highly recommended. We were delighted with our stay in this homely property. It is well-maintained and very clean. There was plenty of space for us as a family of four (would fit two more people but the children loved not having to share a bedroom). It was close enough to walk to the beach and shops to enjoy during the day. And just a short walk up to the plaza with a great selection of restaurants to choose from in the evening - and more lovely shops too. We also enjoyed a trip to Guadalest in the mountains in our hire car where we spent the day exploring, visiting the castle, shopping and another lovely meal. The owners of this property are very helpful with good, prompt communication. We would stay here again and would recommend to others. Situated in the old town with a lovely view and just a short walk up to the main square. A comfortable, well loved and pretty house. We loved the great kitchen with everything we needed. The wood burner was a bonus and made it very cosy at night. Just a shame the terrace didn't get the the sun when we were there in the winter. The town of Altea sits on the Mediterranean coast and is known for its real Spanish feel, good restaurants, craft shops, and its weekly markets. It is the home of many famous Spanish and foreign artists. The mountain range behind the town provides excellent day trips for walkers or the less active who want to just take in the cool summer air. The citrus blossom from the extensive orange and lemon groves can be viewed from special trains that run along the coast. There is an excellent beach at Altea only 5 minutes walk away or much larger, sandy beaches at Benidorm (10 minutes drive) or Calpe (15 minutes drive) Altea and it's surrounding areas provide a cultural and sporting paradise.